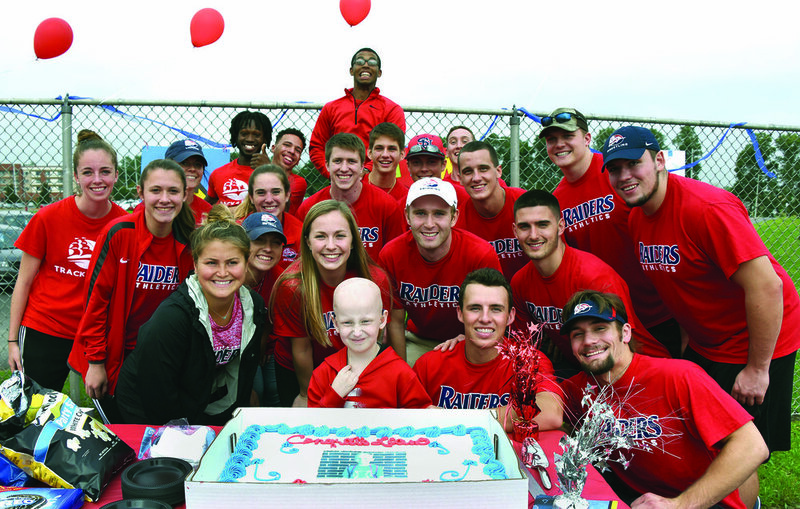 Arguably, SAAC’s most visible contributions stem from its charitable efforts, as Raiders seek donations for the Make-A-Wish Foundation—the national charity for NCAA Division II. SU has partnered on multiple occasions with Make-A-Wish Philadelphia, Delaware, and Susquehanna Valley to grant children who have severe, life-threatening conditions with a once-in-a-lifetime opportunity. Over the last four years, SAAC has granted two wish reveals for kids in the region. 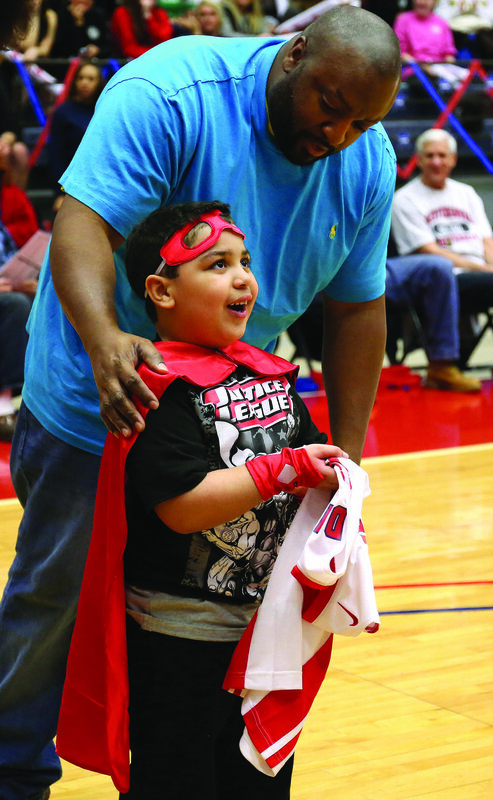 In 2016, James “Jay” Dawson (above) joined a Raiders basketball game as a superhero for the evening. Jay was diagnosed with a brain tumor at two years old, and after surgery, they discovered he had epilepsy and a neurological condition. After several surprises throughout the game, SAAC revealed that Jay and his family were taking an Orlando vacation. The second reveal came during the 2018 football season. 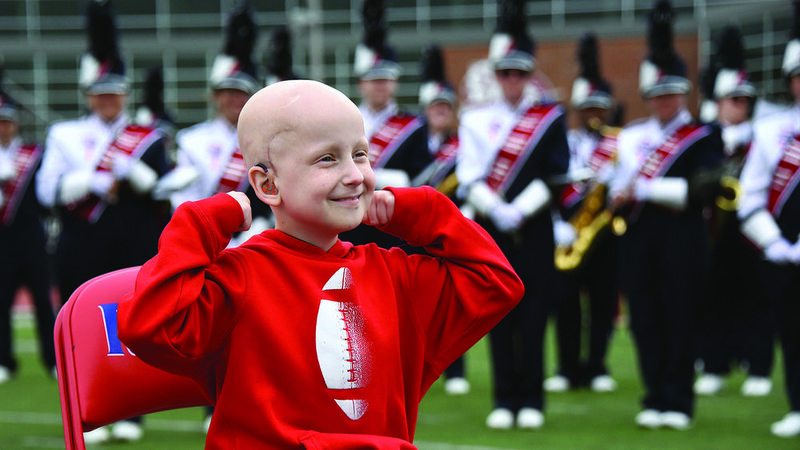 Liam Kepner (below) was diagnosed with medulloblastoma, a rare brain tumor, at the age of five. His wish to go to Legoland was granted at halftime on the field of Seth Grove Stadium. Beyond the $36,000 SAAC has raised for Make-A-Wish Philadelphia, Delaware, and Susquehanna Valley, the NCAA Division II has contributed nearly $6 million since forming its partnership with Make-A-Wish in 2003. Maddie Mulhall, former SAAC president, was heavily involved with both wish reveals and the corresponding fundraising. She experienced the payoff for all the hard work that made Jay’s and Liam’s dreams reality. She said the athletic culture at Shippensburg has fostered a sense of responsibility, and student-athletes want to see good things happen in their community. “There’s an understanding that life is so much more than just our sports—financially and emotionally being able to get behind this foundation and supporting these kids who are fighting for their lives is the least we can do,” Mulhall said. According to current SAAC president Jack Goertzen, the NCAA originally required that a school raise a minimum of $5,000 to grant a wish reveal on its campus, and the NCAA matched that amount. Effective in 2018, the NCAA mandates that each school’s SAAC raise the entire $10,000 on its own, making it more difficult for each individual school to reach that goal. Goertzen said it would take longer to set up the next reveal, but he was confident that Shippensburg would hit the mark again in the future. SAAC organizes several fundraisers during the year. “We’ll be at football games, basketball games, or wrestling matches collecting spare change and putting it in our account,” Goertzen said. SAAC also hosts ice cream fundraisers at Goose Bros. in Shippensburg. One of their more significant fundraising events is Athletes Got Talent, in which Raiders from every sport compete and perform. Goertzen said that the talent show is one of the biggest fundraising events of the year and has been integral to making the wish reveals possible. Ashley Grimm, assistant director of athletics, has overseen SAAC’s efforts as its advisor for the last nine years. She has witnessed SAAC’s commitment to charity—an endeavor even more significant knowing that student-athletes typically have a packed schedule. “SAAC members really embody the spirit of the Make-A-Wish Foundation,” Grimm said. “They understand the importance of crossing every T and dotting every I. They know attention to detail and completing a task at hand are both paramount to success. I think a lot of them take a similar approach that they take to their sport. Our student-athletes are involved and excel in so many arenas outside of their sport. 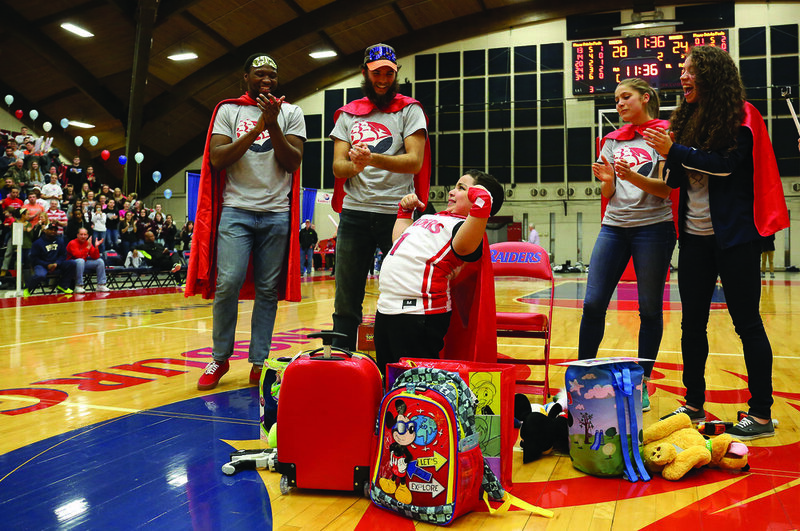 Ben Lee, the regional director for Make-A-Wish Philadelphia, Delaware, and Susquehanna Valley, said Shippensburg is one of the easiest universities to work with in all of Division II. “Shippensburg has developed a reputation at the national level of putting together one-of-a-kind, really significant wish reveal moments that leave all those who witness them—and certainly the wish families themselves—forever impressed with the creativity and generosity,” he said. Of the many wish reveals that take place around the country each year, the dedication and heart shown by the student-athletes at Shippensburg have earned the school an incredible reputation with the national Make-A-Wish offices in Arizona. SAAC is focused on making the next dream possible to create another moment like those for Jay and Liam. The impact the wish reveal can have on a child and his or her family is worth all the time and work that goes into it. “It’s almost like when the event (for their child) is going on, they forget that their child is sick…even if it’s just for the day. It’s such a humbling experience that I feel privileged to be part of,” Mulhall said. Nate Powles is an intern in the SU sports information office and is the sports editor of The Slate.